While American history is filled with amazing stories, perhaps one of the most complex and interesting is that of untaxed alcohol. Many immigrants to America from the 1600s on brought with them the talent, desire, and what they felt was a God given right to turn surplus crops into alcohol. Often, they had no choice, as this was both a very practical way to store the fruits of their labors, and an opportunity to make more money for their efforts. When taxation was implemented, many farmers outright rebelled in what was called the Whiskey Rebellion. Put down by George Washington himself, the rebellious whiskey makers simply went underground. This began a cat and mouse game that is still being played on a limited basis, but it reached its romantic height in the forties and fifties. 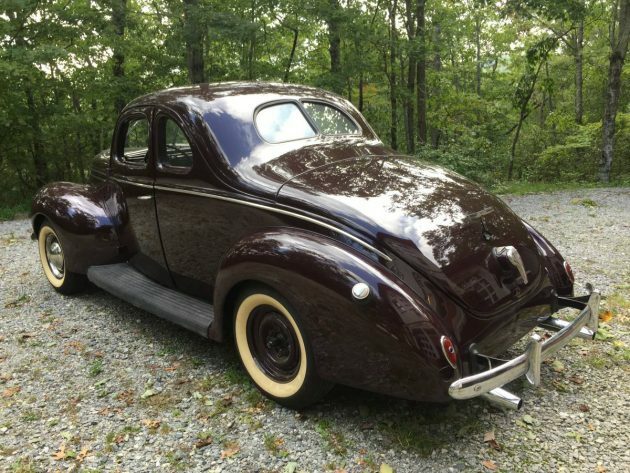 Cars like this 1939 Ford coupe, found for sale on Craigslist south of Asheville, North Carolina, came to symbolize this wild period of whiskey running. 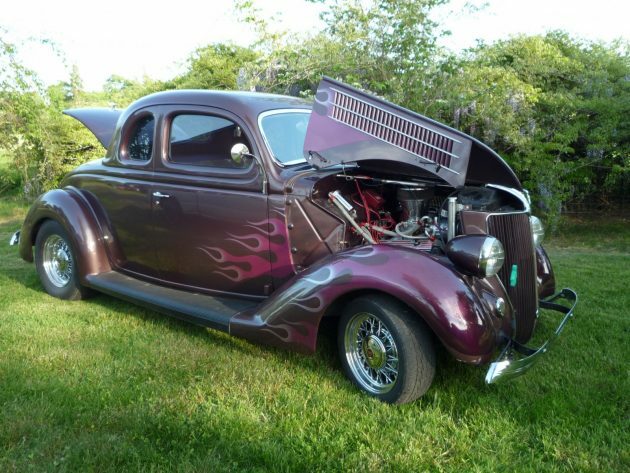 Built up with modifications that would be popular on hot rods from the fifties through the eighties, this beautiful coupe would make a good candidate for a ridge runner replica if you could get past its $26,500 price. While many glamorize this time, the production of alcohol, or “moonshining,” was a deadly serious business that was undertaken out of desperation for many. We tend to look at the past through the eyes of today, a period where we are relatively comfortable. The American South, especially the Appalachian regions, had struggled to find an economic foothold since Reconstruction began. The economy was still mostly agrarian based, and farms were, as a general rule, fairly small. Poverty was a constant companion for many, and opportunities to improve your lot in life were scarce. Many of these people were of Scots Irish descent, and the production of alcohol was one of their most valued traditions, and they used that knowledge to turn crops into alcohol for storage, consumption, and distribution. Prohibition provided a willing market for their liquid products, and, as the Eighteenth Amendment came and went, this market was replaced and surpassed by the thirsty inhabitants of the growing cities of the New South. Someone had to get this product to market, but the illegality of the making, transfer, and selling of alcohol meant that conventional means of transportation wouldn’t work. Somewhere in this portion of the story, the moonshine car was born. Cars like this 1939 Ford were often the choice of moonshine runners. Packed with dozens of gallons of whiskey, these vehicles were often outfitted with heavy springs so they wouldn’t sag when loaded down. 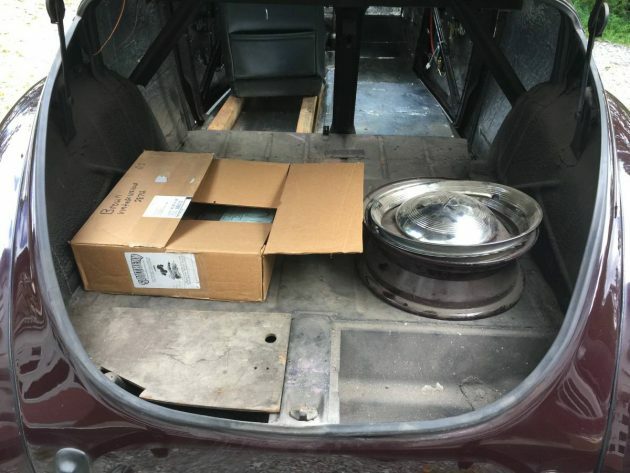 Other tricks were added, from beefing up the rest of the suspension, to adding switches to shut off the lights, drop nails, activate blinding lights in the rear, and even to turn on hidden police sirens and lights. Brakes and gears were often built up with parts from Lincolns, as the heavier cars came with with beefier components. As soon as more powerful engines became available, often V-8s from postwar ambulances and luxury cars, engine swaps became common. Often these engines were outfitted with speed parts and multiple carburetors to get every ounce of speed out of them. Running from the law is a more serious game when the Feds are looking to send you to a penitentiary for your misdeeds. 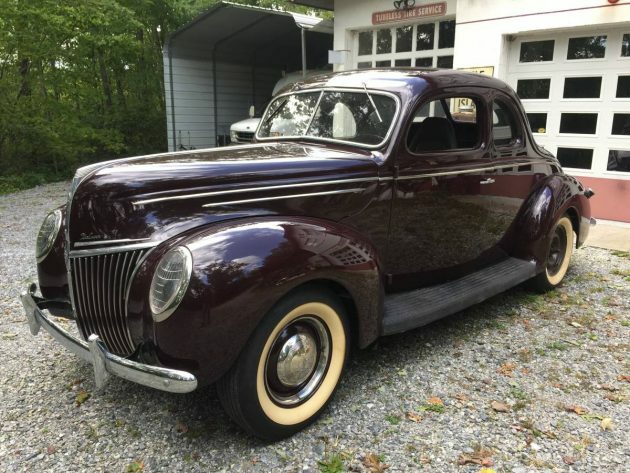 As you can see from the pictures, this car would be a perfect candidate to convert into a replica of the vehicles that tore up the backroads of the South during this period. The coupe body style offered a spacious and easy to load trunk, light weight, good handling, and V-8 power. Boasting an older paint job that is still in good condition, this car is a set of black walls and some helper springs shy of looking the part. 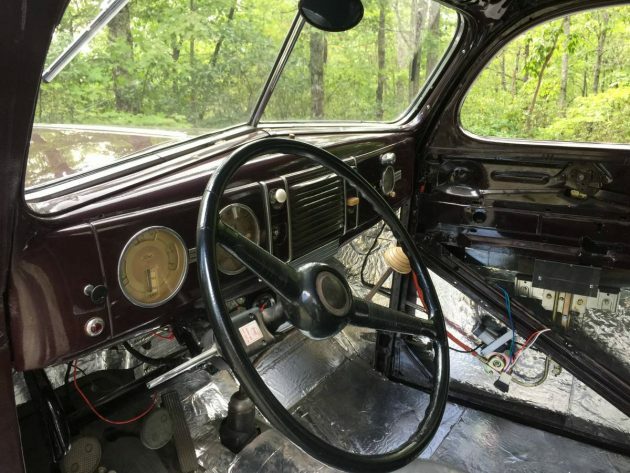 The interior could be finished out as either a standard car interior, or as the occasionally seen single seat with plenty of room to stack crates full of Mason jars loaded with clear liquor. While the aluminum backed insulation would have to be covered over with door and trim panels, and the late model seat replaced with one of the proper vintage, you can see why the spacious interiors of these cars seemed almost purpose built for the job of liquor running. The dash has been kept original, except for the addition of what looks to be a starter button. An aftermarket turn signal apparatus has been added, and the insulation covers everything up front as well. Power window lifts have been added, and would have to be replaced with the original regulator assembly if a return to original or to the moonshining period was done. As mentioned previously, the original seat is missing, and there is no mention in the ad if it is available. Dennis Carpenter Ford Parts could probably sell you the components needed to build up an aftermarket copy that would be period correct. Sitting under the hood is what appears to be a later model Ford Flathead V-8. 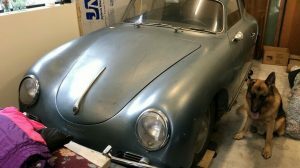 It is outfitted with Offenhauser finned aluminum heads, a dual carburetor intake manifold, and a later model chromed alternator. 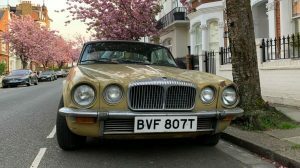 If you were making the car period correct, then the unusual hoses from the top of the heads to the radiator would have to go, as would the chrome alternator. Otherwise, everything has that vintage look and feel to it. 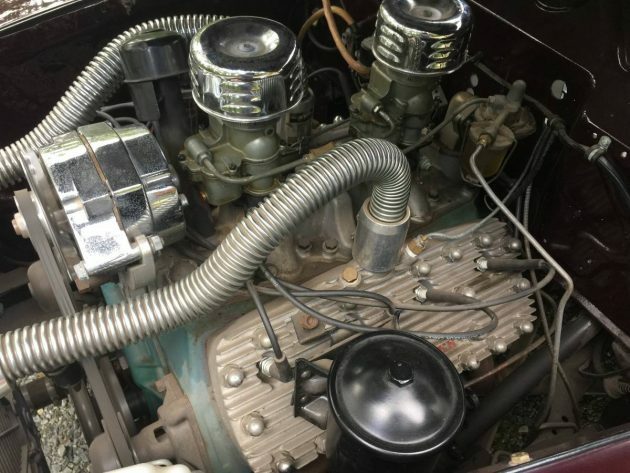 While it would be tempting to look for a bigger engine from the late forties and early fifties, the beefed up Flathead would be an appropriate choice. As the economy of the South got better during and after the war, the need for small still moonshining and death defying runs from the law thankfully diminished. People moved from the farm to the cities, got jobs in factories, and started the climb into the middle class. While a small percentage of the whiskey runners ended up in what became NASCAR, many others continued on as mechanics, body men, and in many different automobile related industries. Those that didn’t often ended up with fast cars as a hobby. The period that made hot rodding a staple of Southern culture still lives on in the blood of every true son of the South, and in the blood of some Southern ladies as well. Cars like this 1939 Ford remind us of how our ancestors in the South both put food on the table and put gasoline in our DNA so long ago. 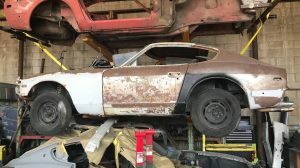 Provided the body doesn’t have a lot of filler and the frame is solid this car has great bones and well worth the asking price. There’s not much to nitpick on that car. It’s sweet. The CL ad says the guy has a 350 you could swap out… I wouldn’t dream of that. The flathead is perfect. Always wanted a 39, awesome timeless styling. My wife said nothing more can come to our house until something goes. I am still trying to figure out where I can move her. When you find a place let me know! Great write up, Jeff. There was a discussion on another well known auto site, on what was the 1st muscle car. Someone mentioned the “Rum Runners” cars. Some of these Ford’s were supercharged putting out close to 500 hp. I think race car driver Junior Johnson started his career by being a rum runner, although, from what I gathered in an interview, he’s not too proud of that. While I’m no advocate of breaking the law, it’s amazing what these folks did to get the “job” done. Great find. Hi Rube. Back in those days, a person either fed his family or the whole bunch starved. A man swallowed his pride and did whatever he could to make a living. Back in the 20’s, in the ranching country along the US/Canadian border there was a lot of bootlegging going on. America was thirsty and Canada had the booze. And mobsters like Shorty Young, in Havre, MT, the boys in Lolo, MT, and even out east to Al Capone’s territory, had a lot of clients to supply. It’s no big secret that there were some ranchers around the Sweetgrass Hills (to the east of I-15) who made a lot of money just supplying the right of way for the caravans of trucks heading south. The old timers used to talk about the 20s when the ranchers out east came into town driving shiny new Chryslers, Buicks, and even Cadillacs and Lincolns, at a time when the average farmer might own a Model T. A lot of smaller farmers played a significant role keeping the right of way open, and often repairing the trucks that broke down. The little people made money from the big people and oftentimes, it was the only money they got…. It’s no “secret” who hung out in places not far from me, to let the “heat cool down”. Many mobsters came up from Chicago, most famous, Al Capone’s hideout near Hayward. N.Wis. was pretty desolate in the 30’s, and many locals looked the other way, when these Caddy’s and Packard’s came rolling into town. One guy I knew, his uncle ran a fishing guide service in the 30’s, and while, not much was said about who he took fishing, everybody knew. Looks to be converted to 12 volt, as the original generator has been replaced with an alternator and of course the power window lifts!!! Great looking bones to finish off into a sweet ride!!! A beautiful car from the outside, but too expensive when compared to my ’36 Streetrod sitting my garage which can be driven out for $36,000. I like it. A lot of character and with a few things (like a seat) appears to be basically drivable as stands. Excellent write up……….Robert Mitchum had it going on too! Don’t forget, men, that a muscle has always been defined as a mid/compact sized car sold new with an engine intended for a full size car of the same manufacturer. That started in 1964, no doubt about it. 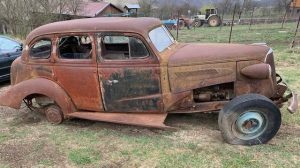 The 39 DeLuxe that would go on into the next year to be the 40 Standard. I would much rather have this one over a 40 DeLuxe. 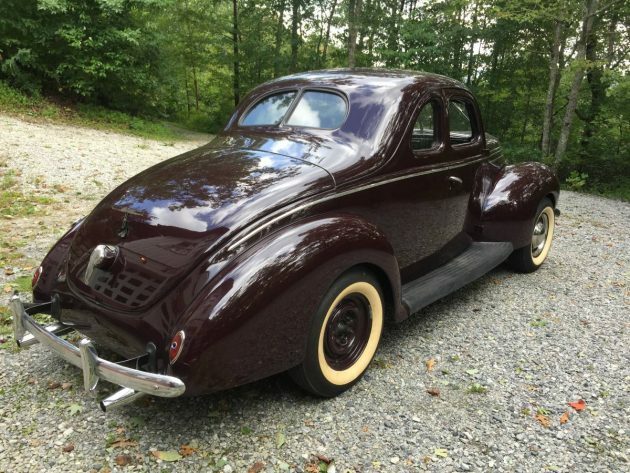 Better yet….I would choose the 39 Standard but in two-door sedan configuration. Much more comfort. All-time classic design! Love those fat fenders. What Dallas and the rest have said….looks to be the factory color my 39 should have….still on the fence on that color. Fast cars have always been built like Henry’s 999 car….and Capone ?….his was fast and bullet proof in the 20’s ! downtown. What a hoot that would be! Hi Ken. There’s got to be something wrong with the system when a person can make more money running booze and drugs around than working the traditional 8 – 5. I heard of a couple of farmers that paid off their farms in less than 3 years cultivating Canibas. It was often tempting for me but I would’be been the one who got caught. So I did it the hard way. But put me in a situation like some of those others and you never know. 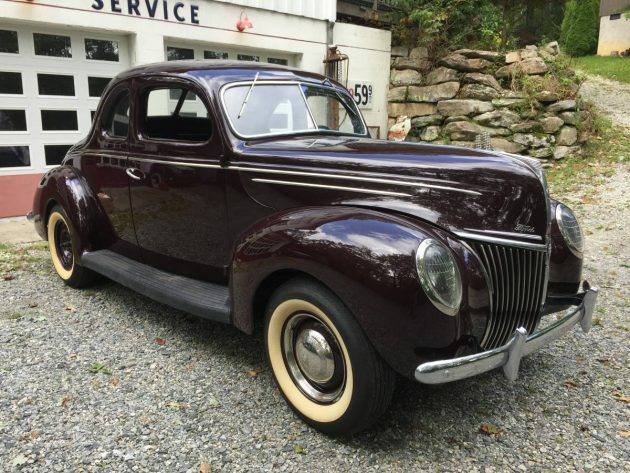 Saying that, I sort of doubt that a Chevy Avalanche, a Chevy Equinox and a Ford 3/4 ton would have the class that this car would have…. don’t have no indoor plumbing back home in the West Virginia hills. Hot water was boiled in a bucket on the wood stove. had to get use to indoor plumbing and taking a bath no matter what when I went into the Marines in 65. paw=paw had a “liquid soap” route, till he died in 1977. Very nice and not so many out there as the 40 deluxe’s. Nice to see a hopped up flatty under the hood! I love the 39 Ford Deluxe! Has the crank out windshield for ventilation, one piece side windows and wood grain dash. It appears to be a good deal at that price.